Meta, it is a unit of tags, used to provides description and keywords of a web page, where search engines use them to indexing a website or weblog onto their search results. Adding Meta element is an important thing to list your page at search engines, especially to raise your SEO. If you use old navigation interface, go to Blogger Dashboard, then click 'Design' and switch the tab to Edit HTML, do not forget to backup your template before do this trick, click 'Download Full Template' link that is located at the same page, then after that, click Edit HTML. For new navigation interface, go to Blogger Dashboard and click menu tree between pencil button and 'View Blog' link, click Template and click Backup/Restore button at the top-right corner of the page to download your full template. After you download it, click Edit HTML. You should replace the yellow marked text with your own as they say. See at the picture to know details if you get lost. That is where you put the code, click to enlarger the picture. Then, save your layout, wait for couple of hours or up to 24 or 48 hours as you wait search engines to indexing your blog. The result at Google Search Engine result. 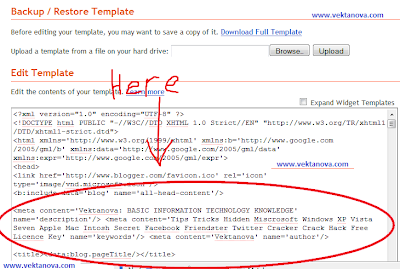 8 responses to "Add Meta Element onto Blogger"
I can't change the meta tags, why? it says "it should be terminated by en < /meta >"
We've renewed the meta tag, it should be fine by now.